Dr. Alan K. Betts, a scholar of meteorology and theoretical physics, can speak with scientific precision about the impact of global warming on Vermont. But it's simpler for him to tell the story about picking brussels sprouts from his Pittsford garden this past winter. When the 61-year-old atmospheric researcher moved to the state three decades ago, he wouldn't leave any fruit or vegetable outside during the winter. Instead, he harvested everything before frost took a bite each fall. "It used to be a challenge for me to have brussels sprouts to eat for Thanksgiving," Betts recalls. "But the last few winters, I've had brussels sprouts for Christmas." Then one spring-like day this past January, he reached down into his garden and pulled up a handful of ready-to-boil brussels sprouts. For Betts, it's just one example how global warming is cropping up in the state. "Traditionally Vermonters didn't plant until Memorial Day. Now I start thinking about putting in frost-hardy things in April and tomatoes as early as the first of May, and I'll finish planting by Memorial Day." The growing season is mushrooming from start to finish. 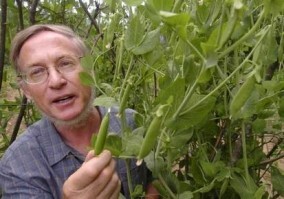 Last year Betts planted peas the same time everyone else filed their income taxes. And for the past five years, the frost that usually befell in September has held off until the first week of October. -20) and the southern tip as zone 5 (with lows of -20 to -10). But this past year, the National Arbor Day Foundation released a new map showing the lows have grown higher. Vermont has lost its colder zone 3 up north, while the entire southern half of the state now sits in the warmer zone 5. "From an agricultural point of view, it's going to be much easier for us to grow a wider range of summer crops," Betts says of the change. But don't give that a green thumbs up just yet. He has yet to explain the downside. When Betts recalls his childhood in post-World War II Britain, he talks of "gaw-dins" ripe with "toe-mah-toes." He inherited his accent from his motherland, his aptitude with garden tomatoes from his father. His interest in weather and climate came when he studied science at the University of Cambridge, England. "I wanted to do something that involved looking out at the world rather than in at atoms," he says today. Betts earned a doctorate in meteorology at Imperial College in London before moving to the United States in 1970 to work at Colorado State University. It doesn't rain much in the Rocky Mountains. Most people like that. But the Englishman was homesick for wetter weather. Contacting a friend who sold real estate on the snowy slopes of Vermont, Betts bought 30 acres in West Pawlet in 1976 and built a home with solar power and wood heat in 1978. Moving north to Weybridge a decade later, he settled into his current home in Pittsford in 1992. "The very first thing my wife and I did here was dig up a section and start a garden." Today their 160-year-old white clapboard Victorian is surrounded by towering willows and evergreens and tidy flower and vegetable gardens. Betts starts the latter each spring by sowing peas, lettuce and spinach. "The books all say you plant those as soon as the ground can be worked." Arriving in Pittsford 15 years ago, he wouldn't dig in before the third week of April. This year, however, he could turn the soil in late March. Shortly after planting salad greens, Betts seeds carrots and beets. In early May, "I start making guesses about whether I can set out tomato plants." Then he moves on to basil, squash and finally sweet potatoes. "The last few years I've had magnificent sweet potato crops, which I never used to consider growing in Vermont. But we now appear to have a long enough growing season for them." Betts isn't the only one noticing the earlier sprout of spring. Scientists reviewed bloom dates for lilacs in 72 northeastern U.S. locations from 1965 to 2001 and for apples and grapes in roughly the same region and time period to find "an average advance in spring bloom of about 4 to 8 days," according to the 2005 report "Indicators of Climate Change in the Northeast" by the University of New Hampshire's Climate Change Research Center. This has advantages and disadvantages, the report says. "In some cases, it may translate in a straightforward fashion to earlier yields. This will benefit farmers who receive higher prices for earlier production, but … earlier bloom could potentially reduce yields if spring temperatures become more variable as the climate changes and an early bloom increases the risk of frost damage to flowers and developing fruit." The report cited a study of New York state apple production that discovered warmer temperatures from Jan. 1 to the first bud break "correlated with lower, not higher yields." The Northeast findings added "there is already evidence in some regions that climate change can encourage invasive weeds." Betts himself is reaping bushels of healthier results. He's already harvesting lettuce, spinach and peas. Next month he expects to eat garlic — he plants it as a garden border to repel woodchucks — and broccoli. He'll end the summer picking tomatoes and squash and start the fall pulling potatoes, kale and brussels sprouts. Betts' salad days end with the first frost. When he moved to Vermont in the 1970s, he would shiver in the middle of September. But in recent years, he hasn't felt the chill until as late as the middle of October. Betts used to dig up his garden before the cold burrowed down. Now he tucks his more hearty crops in. "Some 20 or 30 years ago, there was no way you could winter over anything in the cabbage family — it would totally destroy it." But for almost two weeks this past January, his backyard sprung with green grass and temperatures as warm as 60 degrees. Betts picked some brussels sprouts and blanketed the rest with raked leaves before snow fell a few days later. Brussels sprouts can survive temperatures of 15 degrees or colder when covered correctly. "They were essentially preserved as frozen vegetables. We ate them into April. This is an exceptional year, but illustrative of what will become a more typical year as we move forward into the future. Things like peaches always have been marginal in Vermont, but I think they would survive now. There are a lot more fruit trees we'll likely to be able to grow this century because they require zone 5 or 6." The latest plant hardiness maps place the lower half of the state and most of the Champlain Valley in the fruit-friendlier zone 5. No Vermont community has recorded annual lows around zero that would categorize it as zone 6. But the western half of Massachusetts has warmed enough in the past 15 years to shift from zone 5 to zone 6, and researchers predict that without a worldwide curb in fossil-fuel emissions, southern Vermont may soon follow. In its 2006 report "Climate Change in the U.S. Northeast," the Union of Concerned Scientists says Vermont not only could feel like North Carolina by the year 2100 but also could see its first leaves and blooms a projected two days earlier each decade, "meaning that spring will arrive almost three weeks earlier by the end of this century." Betts knows that sounds good. "For the next 20 or 30 years, growing conditions in Vermont likely will improve." But he says there's a flipside. "I say 'likely will improve' — there's one caveat, one problem in all of this." Scientists are projecting average Vermont temperatures could rise as much as 10 degrees by the end of the century. But they can't as easily predict future precipitation that's critical to crops. "In Vermont we have enough rainfall and it's distributed throughout the year," Betts says. "What's likely to happen is we'll get more precipitation in winter and an earlier runoff in spring, but we'll probably have more periods of drought in summer." His reasoning: Higher temperatures lead to more evaporation of water into the air. That causes more heavy downpours that, rather than soak the ground slowly, run off into fast-flowing rivers and streams. "It's not clear whether we'll get enough extra rain in summer to balance the extra evaporation," Betts says. "For small-scale gardening, I suspect we'll have enough water, but I don't know what it's going to mean for agriculture as a whole." Several environmental organizations have similar concerns. Clean Air-Cool Planet, a nonprofit, nonpartisan advocacy group based in New England, warns on its Web site: "Crops such as field-grown tomatoes, lettuce, broccoli, potatoes, pumpkins and cabbages, as well as fruit such as apples and pears are particularly vulnerable to increasingly variable and extreme weather conditions." The U.S. Environmental Protection Agency, in a 1998 report "Climate Change and Vermont," adds that changes in temperature and precipitation could impact farmers not just of crops, but also of livestock. Some 85 percent of state farm revenue comes from dairy cows, which require silage and hay. "Yields of these crops and pasture could fall by as much as 39 percent under severe conditions as temperatures rise beyond the tolerance levels of the crop and are combined with increased stress from decreased soil moisture," the EPA report says. "Livestock and dairy production may not be affected, unless summer temperatures rise significantly and conditions become significantly drier. Under these conditions, livestock gain less weight and pasture yields decline, limiting forage." Farmers' demand for more water could drain everyone. "Warmer climates and less soil moisture due to increased evaporation may increase the need for irrigation," the EPA report says. "However, these same conditions could decrease water supplies, which also may be needed by natural ecosystems, urban populations, industry, and other users." Betts hasn't experienced any problems yet. "There's not very often that I actually have to water my garden. I would say once a year I have to irrigate with a sprinkler, and there have been some years I've never had to do it." But he worries that with continued warming, Vermont's agricultural growth eventually will wilt. "As the temperature rises toward the end of the century, we'll probably be past the peak, and growing conditions for much of the United States will start to deteriorate." And so Betts is traveling the state with speeches and newspaper and radio commentaries, outlining the science of global warming and what people can do about it. He can explain how fossil-fuel emissions lead to heat-trapping greenhouse gases that lead to global warming. But it's easier for everyone to see his Toyota Prius hybrid car that gets 50 miles per gallon, double his old vehicle's mileage. At his house, he has installed double-paned windows, more insulation and a more efficient air and water heating system that saves energy and money. "We really can't continue on our fossil-fuel path, and people need to understand why. We are changing the natural environment through our industrial society, and far too many people don't have sufficient roots in the natural world to really understand at a deep level what is happening." Which brings him back to his garden. It takes time to plant, water and weed. But he knows what he reaps will feed his future. "The temperature for the end of the century depends in huge part of what we do in the next 20 years. People in our culture are not used to thinking generations ahead. But the more we have roots in the earth, in gardening and in agriculture, the easier it is for us to see and understand what we need to do to bring our society back in balance with the natural environment."